Surroundings Around opened up a discourse about ecosystems and integrity through focusing on the relationship between human activities surrounding the fishing culture. 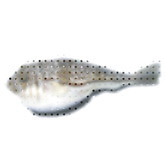 The work focused on the pattern of tears on the cheeks of the native blowfish (Weeping Toado) to evoke empathy and reveal human hypocrisies towards other animal species and 'by-catch'. By-catch is the unwanted and untargeted capture of sea life that is discarded at the end of fishing trips. While dolphins and turtles are protected species in commercial fishing, the native blowfish is discarded as by-catch in recreational fishing. The exhibition was a critique of the Western anthropocentric world view. The project revealed human-centred views by focusing on 'by-catch' and discard issues associated with the Weeping Toado (Torquigener pleurogramma). Through focusing on this fish, the project aimed to shift people’s attention toward broader ecological issues, such as by-catch in commercial fishing. By exploring people’s prejudice towards the fish, particularly when based on its utility and aesthetic value, the project questions the individual life of the fish and its associated intrinsic value. To go beyond prejudice and toward intrinsic value, the most fundamental point is the notion of biocentric equality. Finally, self-realisation and the 'unfolding self' as expressed by traditional Japanese philosophy are referred to as an essential process for change in human attitudes towards nature. The work aimed to encourage a deeper ecological consciousness that will lead to continuity between humans and the Weeping Toado. Two Weeping Toado were displayed as a fisherman’s by-catch for three months at School of Animal Biology in UWA. The exhibition was completed by releasing the fish to the natural environment at the end of the show. This project was completed with the generous support from many people throughout the period of activity. Rick Roberts, technical manager in the School of Animal Biology, provided guidance on keeping two Weeping Toado and setting up the marine aquarium; Stuart Bunt from the School of Anatomy and Human Biology provided support, Mary Lee and Leonie Khoo provided histology-based technical assistance and helpful comments with samples; Guy Ben-Ary was greatly supportive regarding microscopic techniques in CELL Central; Ray Scott in the Combined Workshop constructed an aquarium stand for this project despite his tight schedule; P. James Bryan provided access to his screen-printing studio and printing on weekends; and Central TAFE gave permission to use the Artist-in-Residence gallery space. Kaori Yamashita was born in 1979 in Kyoto, Japan. She graduated with a Bachelor of Fine Arts in Printmaking at the Kyoto City University of Arts in 2003. Her early work explored the theme of self-searching in relation to other people through self-portraiture. Kaori is also interested in the relationship between humans and the natural world and has developed this theme through her screen-printing practice. She has researched biological arts related to bioinformatics while undertaking of Master of Information Science at Nagoya University in Japan from 2003 to 2006 and completed the Masters of Science, specialising in Biological Arts at SymbioticA, in the School of Anatomy and Human Biology at UWA in 2009.